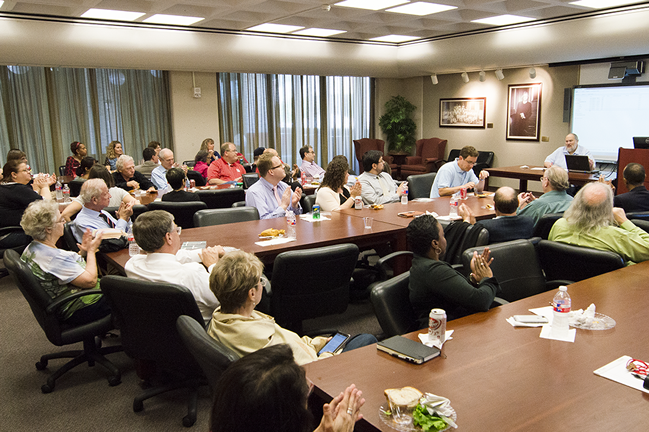 Sept. 5, 2014 -- The Law Center’s own “Rock and Roll Law Professor,” Michael A. Olivas, kicked off the second season of his NPR radio show Friday with a lunch hour preview for faculty and staff. He launched the weekly, three-minute program, the “Law of Rock and Roll,” in January on KANW, 89.1 FM with hopes of expanding to other stations across the country. The morning, drive-time show provides an outlet for his encyclopedic knowledge and lifelong love of rock and roll. He expects another ten stations to pick up the show in this second year. The show’s website is under construction and will be up and running this semester. In addition, he will be lecturing to entertainment lawyers in the spring. “I will concede that I have a face for radio,” he said, “especially public radio,“ but he is not about to give up his day job as William B. Bates Distinguished Chair of Law and director of the Institute of Higher Education Law & Governance at the Law Center. Each “class” opens and closes with “Legal Matters” by the Who with a lively description of case law dealing with specific artists or music-related issues and snippets of the best of rock and roll sandwiched in between. Olivas has recorded 12 new shows delving into burning, showbiz, legal questions of the day. Topics include: Are a rocker’s leather pants tax deductible? Can lyrics be used as evidence in criminal court? Can politicians hijack rock anthems for election campaigns? And, what happens to future royalties when rock marriages fall apart? He also explores weightier issues concerning music industry business practices and more serious subjects such as disability laws and concert seating.